Share Your Naija Story and Win in Astymin Go The Distance For Naija Contest!!! Nigeria celebrates her 58th Independence Anniversary on the 1st of October 2018. As a corporate citizen and in a bid to connect the true Naija Spirit, We at Fidson, through our Astymin brand are out to re-ignite the true ‘Naija Spirit’ of passion, resilience and can-do in the average Nigerian. 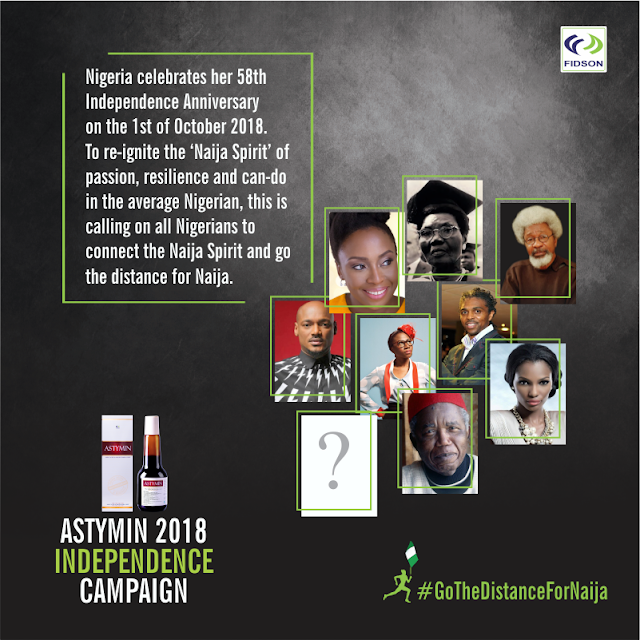 ASTYMIN is therefore calling on Nigerians to revive their winning mentality by giving their best and going the distance for ‘Naija’. - How you have gone (or will go) the distance for Naija. Visit http://www.fidson.com/GoTheDistance to share your story. Entries close on 23rd of September 2018.